I’ve always enjoyed fishing. At least, I enjoyed fishing as much as one can enjoy fishing when only two or three times a year. My Aunt and Uncle not only enjoy the sport, but they’re really good at it. 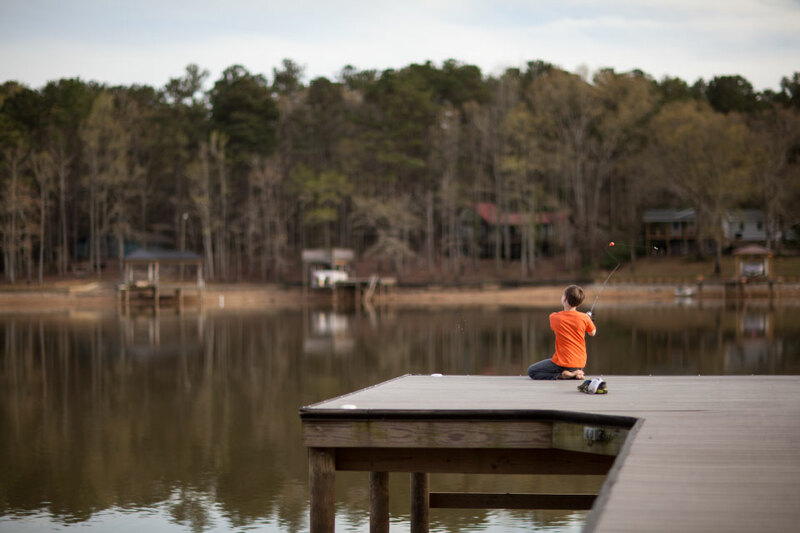 So a few times a summer we’d gather on their dock and they’d orchestrate a fantastic fishing experience, complete with quality fishing pole and perfectly baited hook. Placed right into our hands. No need to do anything except toss the line in. The fish practically leapt into our arms. It was hard NOT to catch them. That’s all I knew of fishing. That was before we lived on the lake. Now I have a little more realistic idea of what fishing is about. And I still love it, but I’ve learned to enjoy the experience more than the outcome. Even though catching something is never a guarantee, I still go down to the dock and throw a line in most mornings during the summer. In fact, Caleb gave me an impressive fishing pole for my birthday last year. I mean, this fishing pole is really nice and worthy of a serious fisherwoman. Unfortunately, it found itself in my possession and it has caught exactly two… TWO… fish since I received it last April. Thereby proving that awesome equipment does not a fisherman make. But looks count for something, right? At least that’s what I was consoling myself with on Saturday morning as I eyed the two guys in a boat about 50 feet from our dock while they reeled in a huge fish. There were fishermen out in droves that morning so the fish must have been biting pretty good. Sound travels incredibly well across the water and comparison is rampant when you can practically see and hear everyone on the slough and know when they catch something. Which is why I did not jump up and down or perform a happy dance when, five minutes later, I felt a huge pull on my line and commenced reeling in a decent sized fish. It was a bass, which wasn’t even the kind of fish I thought I was fishing for. The bait came in a package that said “guaranteed to catch crappie”….? After I got over my shock and got the hook out of his mouth, I stood there for a second with the fish in my hand and had a quick debate about what to do. I didn’t have a phone or camera or any way to document my catch, so I thought about running up the hill and yelling for someone in the house to appear and applaud my fish. But imagining what I would look like racing up the hill (with fish) to take a picture and racing down to throw fish back before it expired, left me again eyeing the fishermen in the boat now 40 feet away who were by now surreptitiously eyeing me back…. standing there with fish. I have now mastered how to look like you know how to fish. I'm convinced, and I wasn't even there.